Lighting: Sunpak 383 reflected into umbrella camera right, Contax TLA280 fired through Alzo Digital softbox from camera left. Quick compositing in Photoshop using original images. 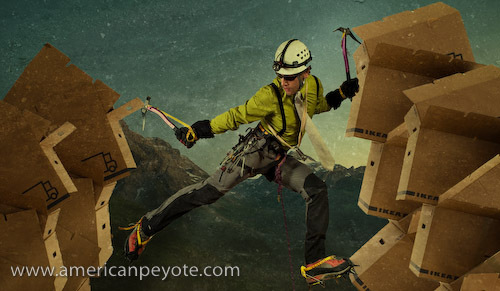 Dry tooling on a mountain of IKEA moving boxes, which naturally occur as a consequence of moving between apartments. Used in an article on Concept to Photo Workflow.